Please note, we no longer do classic car hire. Classic-touring.co.uk has been established by David Sloan to provide classic car storage and classic car restoration. 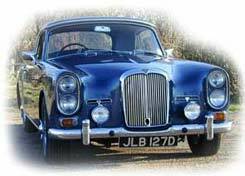 Classic Touring is based near Tunbridge Wells on the Kent Sussex border, central to the South East of England. David Sloan is the owner and founder of Classic Touring. The Sloan family is renowned locally for it's love of classic cars and David has been seen driving his 1909 Commer Shooting Brake - formally The Royal Wells Inn mascot. David's passion for classic cars means, when buying a classic car, you will benefit from his in-depth knowledge and can be assured that the car is in "tip top" condition - all of Classic Touring's cars are genuine classics and are professionally serviced and maintained. The Jaguar E Type and CommerCar shown for sale are my own personal cars. We are now pleased to be able to offer storage for your car in either standard or dehumidified garages. Along with the maintenance of our own cars we believe we are in the right position to care and look after owners cars. View the storage page on this site, or ring to discuss individual requirements.